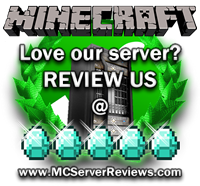 We offer a Great PVP/Factions experience with the option of creative mode(for donators). We have many fun things to do such as our Minigames which consists of Mobarena(to play mobarena type /ma help or /ma join ), PVP arenas(with and without guns, type /ua list to see all arenas then type /ua j ), and Many more arenas such as Spleef. We have the McMMO Plugin so you can level up different skills and get special abilities in the meantime competing with your friends! We also have an economy system so you can earn money by selling items in the Super Shop/Mall or you can Create your own chestshop by placing a chest and putting a sign over it with the quantity you want to sell or buy on second line then price for buy or sell on third line( for example “B 200:S 140″) Then on fourth line put the item id or the Item name (for example: “Iron Ingot”). When you join the server you should read the rules and you will find out how to get out of the room. We Have many worlds such as Survival(GRIEF NOT ALLOWED), Factions(GRIEF ALLOWED), and Creative(GRIEF NOT ALLOWED). Survival provides a great Building/PVP/Survival experience! Factions provides a intense Factions environment where grief is allowed, to learn about the Factions plugin type /f help when your on the server. Creative creates a creative aspect and provides you with the Creative Gamemode, but only VIP members can access this world. 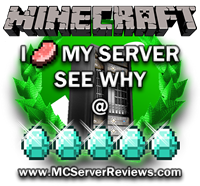 To get VIP you need to Donate to the server to help keep it alive! This server runs off donations so we need atleast 1-3 donations a month, depending on the amount. To donate and get rewards such as VIP goto the Koolcraft Store. We love all out players and hope you enjoy your stay at KoolCraft! There are 0 Positive and 0 Negative reviews of “KoolCraft” sorted by most recent. By clicking submit, you agreed to the rules and are using or have played on KoolCraft.